Welcome to the wonderful world of Whippersnapper parties. Celebrate your child’s birthday with a party tailor made to suit your child. With Whippersnapper music workshops, face painting, puppet and magic shows for your younger children and party games, drama games, dance routines, drumming and discos for the older ones theres something for everyone! Facilities at Brockwell Lido at your disposal: P.A. System, Theatrical lighting and disco lights, bubble Machine and basic Kitchen facilities. 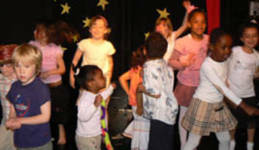 We offer different party packages depending on your child’s age. Please click the option that suits you for a booking form and other relevant details.